Chaldean Archbishop Habib Nafali of Basra, Iraq, speaks to schoolchildren on 5 October at St. Columba's parish in Chester, England, about the persecution of Christians in Iraq. 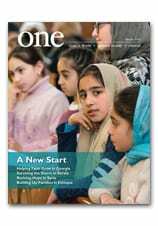 The September edition of our award-winning magazine ONE is on its way to your mailbox, but you can get a first look online right here. The theme of this ONE is proclaimed proudly on the cover: “Sharing Hope.” And in the video below, our president Msgr. John E. Kozar offers a more detailed preview of just what that means. We’re pleased to be able to share our hope with you — and grateful for all that our readers and donors have made possible. Thank you! Kerala banks on tourism to revive its economy (LiveMint) Looking at the camera, several men and women in Kerala comprising fish vendors, rickshaw drivers, homemakers and children among others hold out a placard that reads “We Are Open.” This is how a new advertisement by luggage maker Samsonite ends, aimed at exhorting more tourists to visit the flood-ravaged state. It puts across a message that not just hoteliers and other big businesses, but commoners in Kerala too are seeking a revival in tourism.